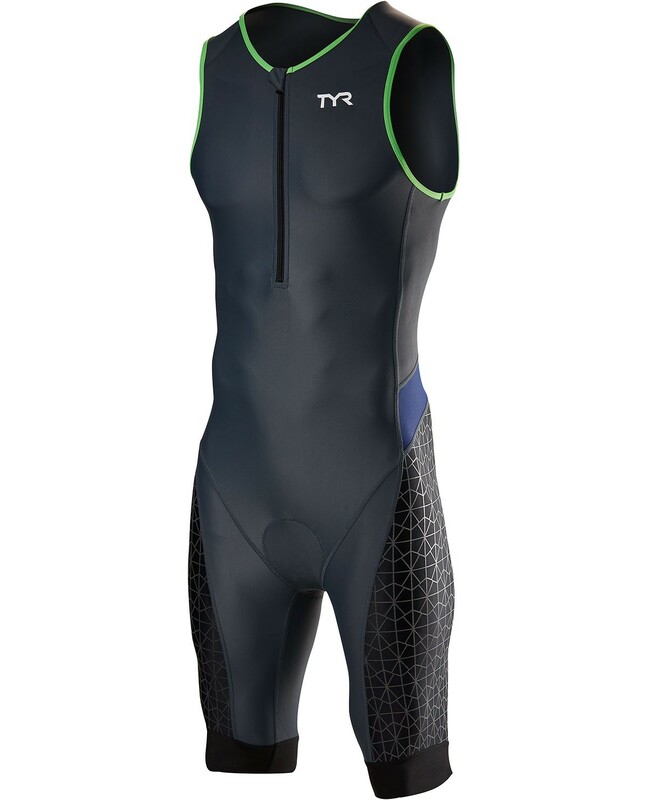 Dominate the disciplines in the TYR Men's Competitor Tri suit. Constructed from our advanced Competitor woven technology, the TTSCOM6A offers stretch, recovery and durability. Equipped with specialized compression webbing for increased blood flow and maximized muscle performance, this tri suit exceeds the bounds of apparel. In addition to UPF 50+ protection, the TTSCOM6A includes a free finish leg grip for a no slip fit that's comfortable on the limbs. With a built in competitor amp pad, the athlete's body weight is strategically absorbed while in aero position, keeping you feeling cool and unrestricted as you run or bike. 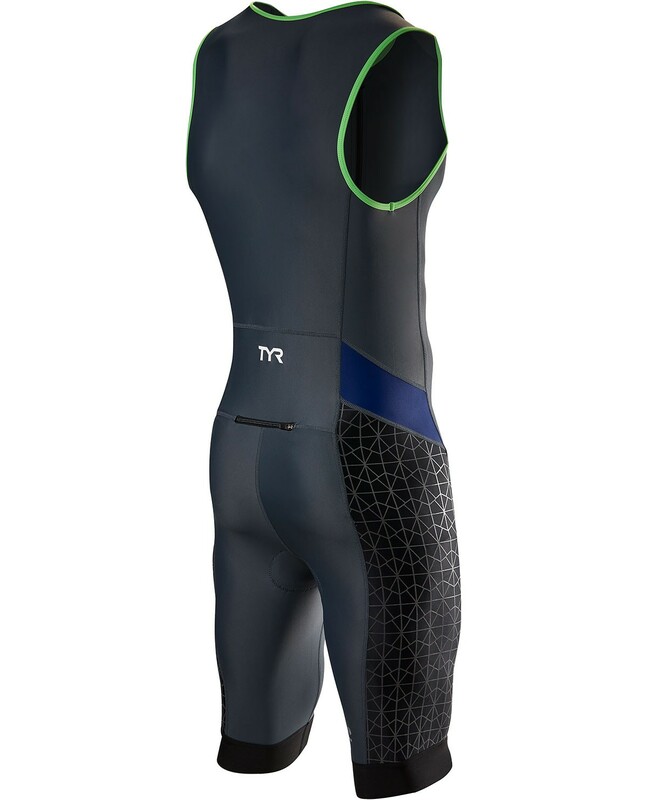 Besides lightweight, quick-drying and ultra breathable fabric, the TYR Men's Competitor Tri Suit also includes back pocket storage and an 11" front locking zipper. Zipper opens quickly and easily, then locks in a preferred position. I’m 6’2” and fluctuate between 165-170. I bought a medium and it fit just right. I come from a swimming background and prefer a tighter fit. This suit performs well across all three disciplines. The chamois was great on the ride and unnoticeable on the run. Some might perceive this as a con but I really liked the small zipper pocket in the back (prevents excess drag on the swim but doesn’t offer a ton of storage) - ideal for sprint/Olympic distance tris. Will definitely be exploring TYR’s more advanced suits as I get more into the sport. Do buy over competitor suits priced equally or higher. It fit well and worked well for my first triathlon. Larger size is need for those who have undergone a particular surgical procedures. The suit I would have fit into by charting was a medium. But because of my condition, I needed a shorter inseam. I went up 2 sizes and it fits just fine. It may not be the ideal fit, but it works for me. Q: How do I purchase a medium? Small and extra large are the only options. A: 1/25 we will offer this in a new color. Q: can you tell me where it's made?